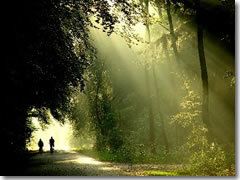 Biking at the Hoge Veluwe National Park.Set in the middle of Hoge Veluwe National Park (tel. 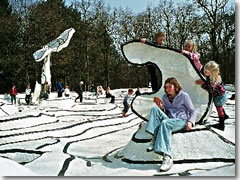 +31-(0)55-378-8119, www.hogeveluwe.nl), a 13,750-acre national park of heath, woods, and sand dunes, is the Kröller Müller Museum, one of the Netherlands' top modern art museums and Europe's largest sculpture garden. This is my favorite Dutch excursion and can easily be done as a day trip from Amsterdam. The primary form of transportation in Hoge Veluwe park is by bike; you can grab a free white bike by any entrance or at the visitors' center—just drop it off before you leave. Under the visitor's center lies the Musenonder, a series of displays and tunnels dedicated to underground ecology. Clambering over the Jean Dubuffet sculpture at the Kröller-Müller Museum's sculpture garden.Many of the rooms in the modern Kröller Müller Museum (tel. +31-(0)318-591-515, www.kmm.nl) are hung with paintings from radically different artists and eras all side by side like wallpaper. There isn't enough wall space to display all 278 (!) van Gogh works, so they're rotated. Other artists featured include Picasso, Mondrian, Seurat, Monet, and Braque. The 27-acre sculpture garden behind the museum is a great setting for works by Rodin, Oldenburg, Henry Moore, Barbara Hepworth, Mark di Suvero, and Lipchitz. My favorite is Jean Dubuffet's enormous Jardin d'Emaille, an interactive artscape of the sculptor's patented white-with-black-lines raised above ground level so you have to climb a set of stairs to wander around in it. The museum is open Tuesday through Sunday 10am to 5pm (sculpture garden closes 4:30pm). The park itself is open daily as follows: November through March 9am to 6pm, April 8am to 8pm, May and August 8am to 9pm, June and July 8am to 10pm, September 9am to 8pm, and October 9am to 7pm. The last enrtry is one hour before the park closes. There's a cafeteria at the visitor's center, and a lovely rural campsite near the Hoenderloo entrance (tent sites: €8). Otherwise, for hotels or restaurants your best bet is to stick to the gateway towns of Apeldorn or Arnhem. Before hopping on that bus in Arnhem, do some advance reconnoitering by popping into the city's VVV tourist office (tel. 0900/202-4075 or 026/442-6767) at Stationsplein 45 outside the station to pick up park info and maps.How to get to Hoge Veluwe National Park and the Kröller Müller Museum: Twice hourly trains run from Amsterdam to Arnhem in 65 minutes. From Arnhem's station, hop on the no. 12 bus, which stops in the park both at the museum and at the visitors' center/cafeteria, where you can pick up maps of the park. There are also buses from the Apeldorn and Ede/Wageningen train stations. Admisison fees: Note that the park and the Kröller Müller are two separate entities, so unfortunately, you must pay admission at both (around €8 at each for adults).